This year I had a little Easter soiree at Casa de B & Chastity. 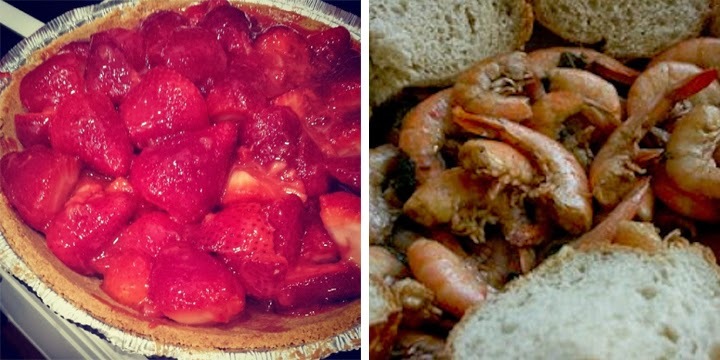 I made some of my favorite dishes that included crockpot Barbecue shrimp and a Strawberry Pie. I've linked both the recipes. If you want something that is delicious and will impress your family or guests these are my two highly recommended nom noms! Please note that you don't want to skimp on making the glaze for your pie by purchasing the pre-made glaze. It's well worth it to make it yourself and it's really not hard. You can even make it a little healthier if you want. I plan to sub in truvia for the sugar next time. Anyways, I hope you all had a lovely Easter. 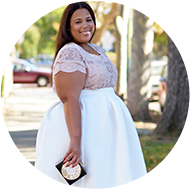 Style Notes: The top is from InStyle Essentials and is one of those tops that are supposed to be tailored for bustier women. In my opinion, they work for the women who have to buy a larger top just to fit the bust area, but they have a smaller waist (42 inches and below) underneath. I'm not one of those women so my top was a sized for a 40F so that it would fit my waist. The top fit fine after the sizing up and I thought it was adorable. The skirt is from Demestiks and upon writing this I see the shop is on vacation. Sorry about that. I did the skirt customized to my measurement and with my length preference. Keep in mind that there is no stretch in this skirt. Also, you will want to size up on the shoes. I had a couple of readers say that the shoes run small. I sized up to a 12 and they fit perfectly. You are so beautiful! I love the entire outfit and especially how you added the pop with the shoes. I am waiting for ASOS to have another sale so I can grab the shoes for a cheaper price. Let me just start by saying that I'm mad that it looks like summer where you are! (I have West Coast envy lol). But as usual, another fantastic outfit! Once I start working again, I am definitely ordering from Demestiks! You look absolutely beautiful. So sorry I can't get skirt.I love peplum. Keep representing #!! Omg I love it, really loving the skirt like a tribal print style which I am loving right now. You look great! 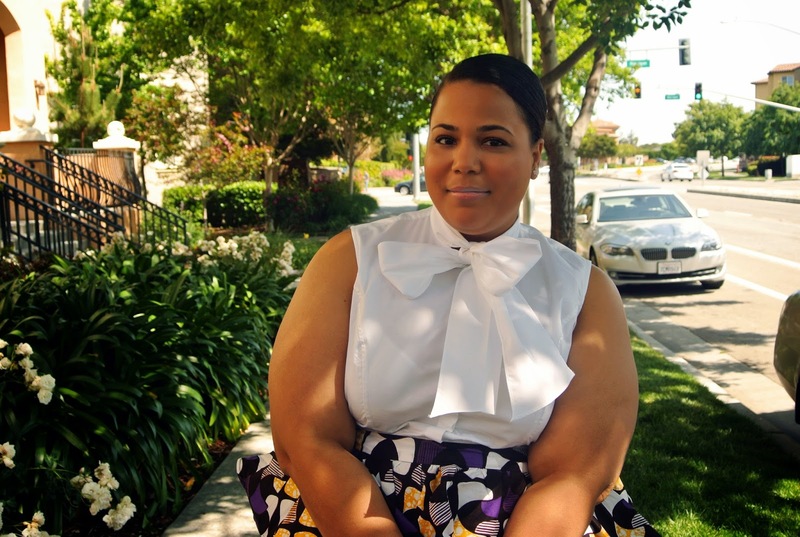 I love the peplum and the tie blouse! I also like the pop of color! Great look!!! Sad, that the skirts are all sold out, but you look fantastic! So I peeped the designer's instagram page @reuel_@reuel. This print is sold out but he's doing the skirt in other prints and they are really cute. Sorry @reuel_reuel and I see a print I have my eye on already! I must know where you shop for shoes. I want comfortable shoes that are also cute and fashionable. I'm not big on heels because they aren't comfortable and I notice that you wear a lot of cute flats. Any place in particular you like to shop for shoes? Nordstrom Rack & Asos. These actually have a small box heel. Hello there in the gorgeous U.S.A,Ciao...great post,your dishes are so invinting,so mouthwatering...so irresistible!...and your outfit is simple a work of Art! I love love your skirt so adorable. Sooooo freakin cute!!! I love this skirt! So cute!! Love the bow! Work it, girl! Love your style it is beautiful. I especially love that skirt.